Andhra Pradesh is an illustration of the diverse styles of temple building in the Indian subcontinent. 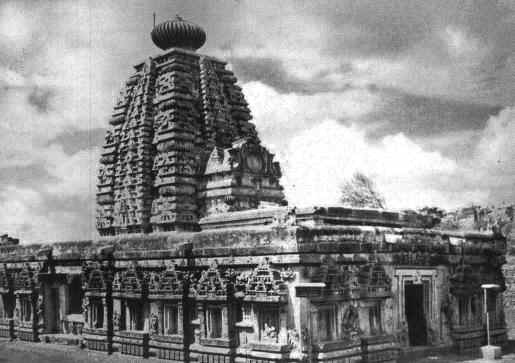 The Chalukyan, Dravidian, Nagara and the Orissa idiom are seen in the construction of temples in this southern state. Tirupati is the best known of the temples of Andhra Pradesh, attracting millions of pilgrims throughout the year. About the Temples of Andhra Pradesh The history of Andhra Desa provides an insight into the various temple architecture styles seen in the state. Tirupati - the most visited pilgrimage center in India. This ancient temple enshrining Balaji or Venkatachalapati is the most visited temple in India. Sree Sailam - one of the Jyotirlingas of Shiva Sree Sailam near Kurnool enshrines Mallikarjuna in an ancient temple. Aadi Sankaracharya composed his Sivanandalahiri here. Alampur Nava Bhramma Temples - Gateway to Sree Sailam Nine ancient temples built from the 7th century CE onwards, dedicated to Shiva constitute the Alampura Nava Bhramma temples. Draksharama - one of the five Panchaarama temples. Legend has it that the Shivalingam held by the demon Taraka, splintered into five pieces and fell at the five Panchaaraama kshetrams one of which is Draksharama. Sree Kalahasti - one of the Pancha Bhoota temples of Shiva Kalahasti enshrines the Vayu Lingam - representing the element wind - of the five elements of Agni, Vaayu, Aakasam, Jalam and Prithvi. Simhachalam - hill of the lion. This temple on the Simhachalam hill represents the patronage of the Southern Cholas and the Gangas of Orissa. Ahobilam - The Nava Narasimha shrine. Ahobilam is one of the most venerated Vaishnava shrines of Andhra Pradesh, enshrining nine forms of Narasimha. 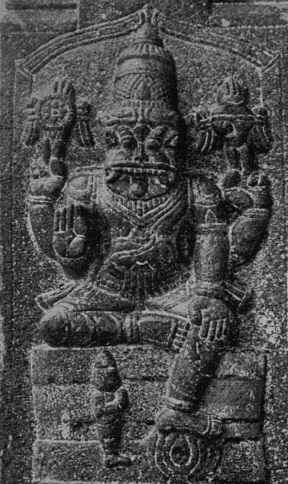 Dharmapuri: near Karimnagar enshrines the Yoga Narasimha manifestation of Vishnu. Mangalagiri near Vijayawada houses a hill temple bearing a shrine to Pankala Narasimha and Lakshmi Narasimha. Akiripalli near Vijayawada is home to a hill temple with a shrine to Narasimha. Dharmapuri near Karimnagar enshrines the Ramalingeswara temple which alludes to legends from the Ramayana. Yadagirigutta: near Bhongir is home to an ancient hill temple enshrining the Narasimha manifestation of Vishnu. The city of Vijayawada is home to the Kanakadurga temple, the Malleswara temple and the Vijayeswara temple. Palampet: The Ramappa temple dating back to the Kakatiya period is full of ornate sculpture. The thousand pillar temple at Hanumakonda, the ancient capital of the Kakatiyas of Warangal is one of great workmanship. Bhadrachalam enshrines a temple to Rama at a spot believed to be where Rama crossed the Godavari as he proceded southwards in search of Sita. The Rajeswara temple at Vemulawada goes back to the period fo the Vemulawada Chalukyas. The Modern Birla Mandir at Hyderabad The Birla Mandir hill temple, built entirely of marble is a prominent landmark in the city of Hyderabad. Mukhalingam - the ancient capital of the Kalingas houses three exquisite temples built in the Orissa style of architecture. The ancient city of Amaravati is home to the Amareswara Shiva temple. Legend has it that Rama offered worship to Shiva at Ksheerarama enshrining Ramalingeswara. Kotipalli (Kumararama) in coastal Andhra Pradesh is an ancient pilgrimage center, housing a shrine to Someswara. Bhimarama or Kumararama at Samalkota houses a temple to Bhimeswara with interesting sculptural work. The Andhra Pradesh Temple Index. The list here provides a pointer to over a hundred temples of Andhra Pradesh.